The two halves separate up to 3 1/2", and the center of the keyboard raises up to 3 1/2"
As research into ergonomics grows, a new age of typing emerges. The Go!2 Mobile Keyboard by Goldtouch is the indispensable splitting and tenting keyboard of dreams. It's also slim, lightweight, and portable, so you can grab it and go, bringing your work with you. You can finally enjoy freedom at your fingertips with the help of the Goldtouch Go!2 Mobile Keyboard model GTP-0044. The Goldtouch Go! Travel Notebook Stand is designed to support your laptop while you work, relieving unnecessary strain on your back, neck or arms. It can pop up quickly whenever you need it, or it can be stored away in a small case for travel. The stand features a strong but light aluminum construction with a Neoprene storage case that can also be used as a mousing surface. It accommodates laptops up to 17'', and when stored away, measures 7.5'' x 10'' in the case. The right-handed Goldtouch Ergonomic Mouse is offered for $15.00 with this keyboard bundle (regularly $59.00). 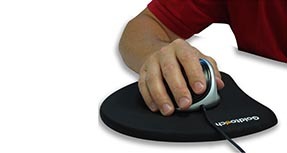 The popular Goldtouch Ergonomic Mouse treats and prevents repetitive stress injuries caused by traditional mice by decreasing hand fatigue and discomfort for users with its unique, contoured shape. The body of the mouse supports a neutral wrist angle of 20° - 30° as shown in the image below. The Goldtouch Mouse design also offers longer buttons with a low click force, allowing users with different sized hands to comfortably use the same mouse while minimizing the pressure needed to click the buttons. You may also choose the left handed version for a discounted price of $39.00. Being used to a full-sized ergonomic keyboard at an office desk, I found that the change to working mostly from a laptop created a challenge to proper posture. A full size external keyboard defeated the size advantage of a laptop. 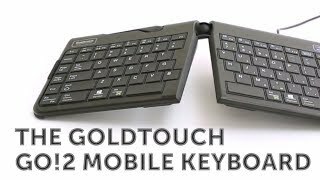 Found the Goldtouch Go!2 Mobile Keyboard in an online search. It's everything it said it was: lightweight, portable, ergonomically configurable. It has a sturdy, although lightweight, construction and is easily adjustable. Even in MAC mode, there is not total consistency with the option and command keys but then it also has a forward delete ability that the MAC does not have. Overall, a great choice even in the office. Took me a couple weeks to get used to layout of keys, but it is such a comfortable keyboard for me to use now. When I tried to use a standard keyboard to make a comparison, my wrists felt kinked and definitely not in an ergonomic position. I will never go back to my old keyboard. This keyboard just feels right and I feel relaxed and safe from carpal tunnel problems. I also like the fact that it's so lightweight, the low profile keys, and the ability to tent the keyboard to my comfort level as well. An excellent keyboard that's both portable and ergonomic. I'm an IT consultant and am constantly typing on a laptop which led to a persistent golf-ball-sized tension in my forearm. This keyboard made that nagging discomfort evaporate completely. More importantly, it's a MUCH better keyboard than my laptop's chicklet keyboard. An excellent product for anyone who types a lot. It's so good I'm considering getting another just in case! As a person who suffers from tendinitis, I have to use an Ergo keyboard. Last year I bought a 10.1 inch netbook and was really happy with it. I thought that the keyboard would be small enough that I would be able to write for at least two hours on it, without pain being an issue. I was wrong about that. I have an ergo keyboard for my desk top computer, but I didn't know they made ones for laptops. I was going to buy a cheap ergo, take it with me to the coffee shop, and plug it in. Then I saw the Goldtouch Go! Travel Keyboard. It fit on top of your laptops' keyboard! I thought that was a real novel idea. A little skeptical, but more than willing to give it a shot, I purchased one for Cyber Monday. I wasn't too sure about it when it did come in, but I played around with it and low and behold it DOES fit on top of my little netbook's keyboard! It sits atop it very solid. No rocking, no shifting. I love the key touch, so light but not so jittery that you can accidentally hit keys. I like the feel of the keys when they strike. It's not hard or "clicky", but you are assured that you have hit the right key. I DO wish that it did have pre-determined angles. Every time I use it, I have to adjust it until it's just right for me. But maybe that's why it's not like that. that's just a little gripe. I loose time writing when I have to constantly readjust my keyboard. My keyboard has an "extra" dot on the i key. I dunno if they put it there on purpose or if it's a flaw. Either way I can live with it although if it's an easy "pop the key off and replace it" fix, I'd be interested. Other than that, I am happy I bought this keyboard! I got a deal on it, and an extra discount because of Cyber Monday. When my desk top's ergo goes out I may have to look at a Goldtouch as a replacement! compact, fits nicely in backpack. Does not fold in half. I bought this keyboard as a specific part of my travel setup, and it's been critical to being productive when not at home. I have a little USB monitor that allows me to have a second screen, and I can put this thing on my lap desk next to a wireless mouse and do my thing. In fact, I even plug the receiver for the mouse into the USB port on the laptop. I didn't even realize the keyboard *had* a built-in USB port! There are some obvious downsides, but I think they were the right sacrifices to make. First off, it's small, so although you can splay and tent it and angle your hands a bit, you still have to bring in your arms. The keys are sometimes a bit small, though I really like the light touch they require - it's a nice touch. Oh, and the Windows key is totally in a weird place. I guess that has something to do with it having two modes. But overall? I'd buy this again in a heartbeat. I switched to a split/tented keyboard about 2 years ago after too many years of heavy laptop use gave me chronic wrist and arm pain. I started with the original Goldtouch, and loved it until the locking mechanism broke. When I was searching for a replacement, I found this version and I like it even better than my original Goldtouch. The positioning mechanism actually works better - my old one used to slide down and needed to be readjusted often, but this one stays firmly in place once locked. Plus since it's so easy to carry, I take it with me everywhere instead of only using it in the office which means I'm getting even more physical benefit from it. I've had this keyboard now for almost a year, it's as great as the day I received it. Lightweight, well made, comfortable to use - highly recommended. I recently moved into a job in which I work out of my laptop bag 80% of the time. I have used a full sized ergonomic keyboard at my desk for the past 10 yrs. When I started using my normal laptop keyboard I had horrible pains in my forearms. After switching to this keyboard, the pain is completely gone. I would not buy this keyboard if I had a desk set-up (keys placement is a little tight) but for a travel keyboard, it is excellent...comfy, small, lightweight. $99.00 List Price: $119.99* The list price is the same as the MSRP (Manufacturer's Suggested Retail Price). It may not necessarily be the price at which the product is sold.